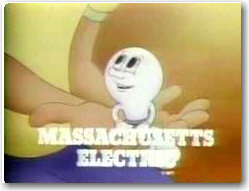 During the decade that my boys were growing up in Massachusetts, Massachusetts Electric had a great commercial on TV called “Lester Lightbulb” . Basically an incandescent light bulb with a smiley cartoon face on it told kids to remember to shut off the light when not in use and to not to put things into the electrical sockets. Energy savings is a good thing no matter what your politics are. Well I’m sure that most of you have heard that the US congress has convicted Lester of “wasting energy” and Lester is set to be executed next year unless someone can get him a clemency deal. I decided to take a look at the case against Lester and while doing so look at the packaging that reportedly is being used for his preferred high tech replacement â? ?¦the LED. Everyone knows the acronym KISS – or keep it simple stupid. Certainly Lester the lightbulb which has been around for more than 100 years obeys that law. I guess thats why mass produced light bulbs cost < $0.50 each. 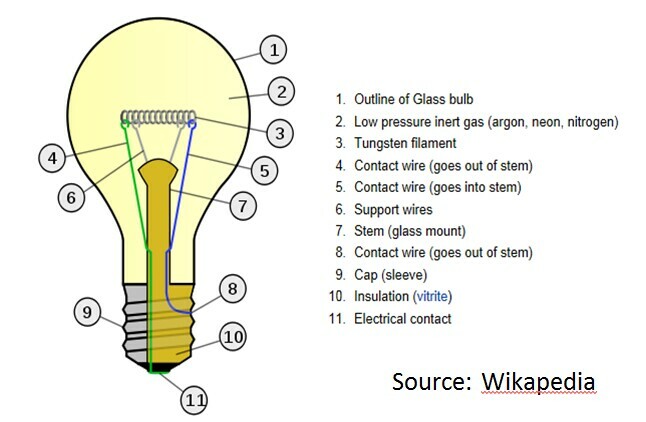 for general service lamps by lamp wattage starting in 2012. Current 100W, 75W, 60W, and 40W incandescent products will be required to consume no more than 72W, 53W, 43W, and 29W, respectively. The DOE very carefully states that the “EISA does not ban incandescent lamps; it increases the minimum efficacy levels” but it is very clear that there will be no imports and no manufacturing of bulbs that do not meet these requirements [link]. There are an estimated 5B bulbs in use today. Anyone wondering why the LED folks are going after the lighting market ? 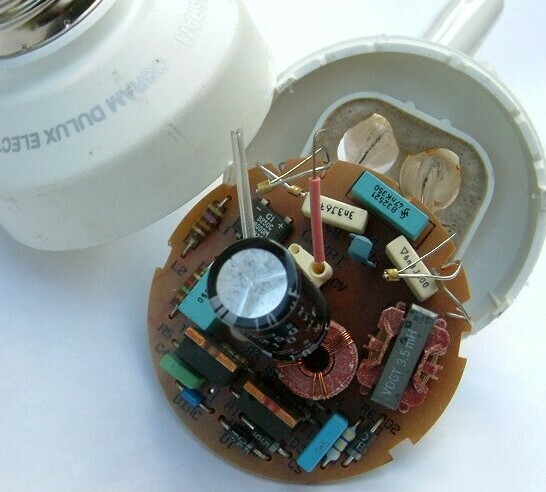 Popping open a CFL reveals a small PCB with ~ 20 components (mainly passives) loaded on its top surface. A bit more complicated than our old friend Lester. The U.S. Department of Energy has had a competition running to find a viable replacement for the 60-watt incandescent . It was just announced that after 18 months of testing the Philips Lighting North America bulb had won the DOE’s $10MM prize. The bulbs had to meet or exceed these requirements: “greater than 900 lumens at 10W or less for an efficacy of greater than 90W/lm at a color-corrected temperature of 2700-3000K and a color rendering index of at least 90”. 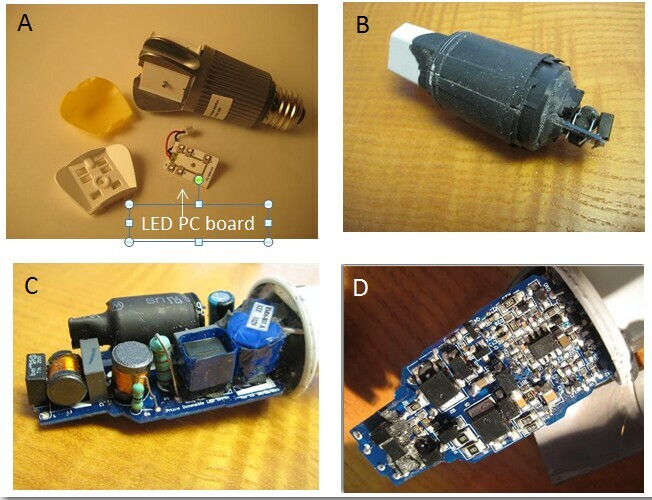 The Philips bulb reportedly exceeded all these requirements during the 18 month trial. Original requirements called for a target retail price of $22 for the first year, $15 for the second year, and $8 in the third year they were offered for sale. 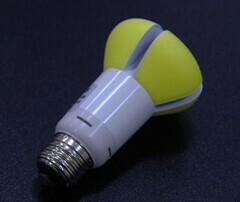 Philips has said it plans to offer the bulb for retail sale as soon as early 2012 although reports are that it will sell for ~$60 due to the higher cost of its materials content. Philips already sells a 60-watt equivalent, the “EnduraLED” , at stores like The Home Depot, although the prize winner is reportedly even more efficient. 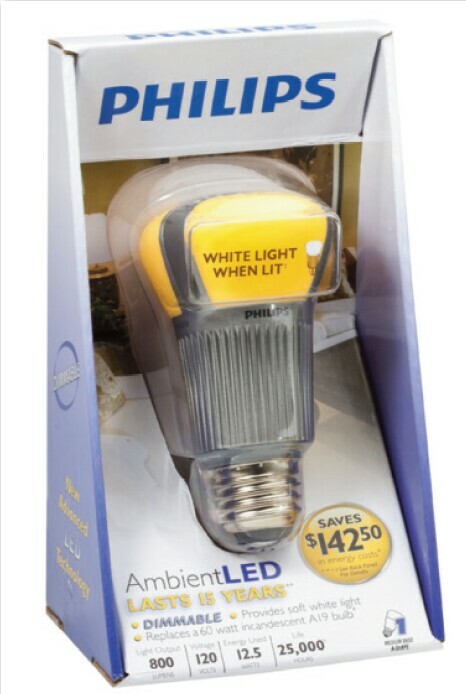 The prize bulb uses just 9.7 watts to match the light output of a 60-watt incandescent, compared with 12.5 watts for the product currently sold. The new lamp is also brighter than the one marketed now, at 910 lumens versus 800 lumens and reportedly closer in color to a standard incandescent. The current EnduraLED (60-watt equivalent) currently sells for $47. The Warranty is 6 years, and Philips rates it at 25,000 hours of operation “it should last for decades if you take good care of it”. We’ll look more at the lifetime later in this blog. I am pleased to report to you that the CEO of Philips Lighting North America, reports that “…the origins and development of this product, as well as its future manufacturing are all in the United Statesâ??¦. In addition, we have publicly said we will use the L Prize money to expand the manufacturing of this product in the United States. We will do this internally [at Philips facilities] as well as with American partners”[link]. To which I say BRAVOâ? ?¦..seriously BRAVO !. In terms of lifetime tests, “â? ?¦.200 bulbs were installed in a lumen maintenance test apparatus in which ambient temperature was maintained at 45°C to simulate the elevated temperatures common in enclosed lighting fixtures. The bulbs were operated continuously. Spectral measurements were taken on each bulb every 100 hrs for the first 3K hrs and every 168 hours (weekly) thereafter. Data for the first 7,000 hours of operation were used to predict lumen output of the bulbs at 25,000 hours. Lumen maintenance is predicted to be 99.3% at 25,000 hours, significantly exceeding the 70% L Prize requirement [link]. I personally would have an on off cycle where the bulb was switched off and then back on every 3 hours to mimic the daily use because we all know that bulbs usually burn out in the power on cycle, not while they are lit (at least that’s true for incandescants). This also only indicates to me what the projected light output would be at 25K hrs, not that the bulb will be functional after 25K hrs. More on that later. (A) The yellow plastic is the phosphor coating on the cover. Because it is located separately from the LEDs its called a remote phosphor. Popping off the phosphor coated covers we see the LEDs mounted vertically on the interior central column on the bulb. The LEDs are mounted on a little PC board which is a bit more complex than the CFL board (tongue in cheek) . The large amounts of metal (this is one heavy bulb) are used as the heat sink to conduct the heat away from the LEDs. Below shows what I was able to find selling at my local Home Depot (An American hardware store). The DOE tells me that “60W-equivalent LED A-lamps (the one listed in our table) at $40 per bulb is 6.3 years at average electricity rates. The government officials like to point you to the “hypothetical” curve of the $5 LED bulb which pays off in 0.8 years , butâ? ?¦well if Lester had a voice he’d say that if a Mercedes cost $10,000 he would buy one of those instead of a Ford fusionâ? ?¦.know what I mean. My local Duke Power rate is 0.08/kWH and both I and the Govt agree that a light bulb is probably on for about 3 hrs a day. So the incandescent that lasts for 1000 hrs gives me 333 days of use or 0.91yrs and costs me : 3hrs x $0.08 /KWH x 0.06KWH/hr = 1.4 cents per day or $5.25/yr or a bulb + power cost of $6.17 / yr . 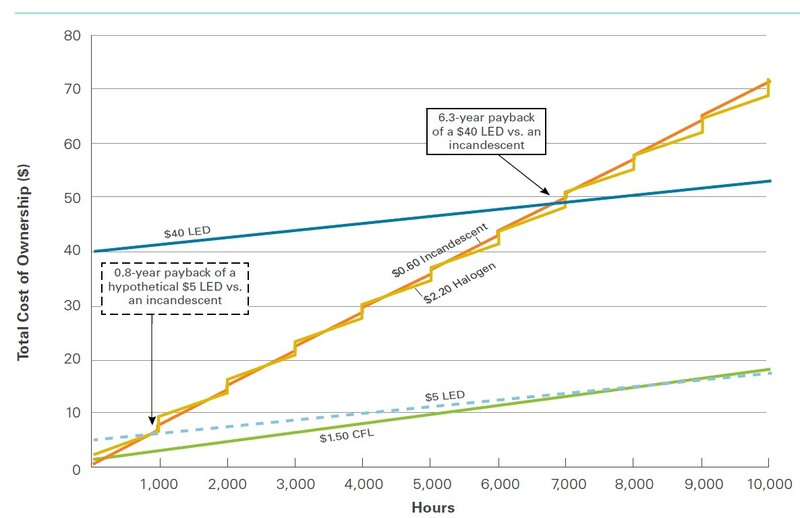 Using the same calculations CFLs would run $2.40 / yr and the LED would cost $2.16/yr. Lets look at the Philips claim of $142 savings. Going out to 25,000 hrs (at 3 hrs/day thats 22.8 years ! – Hard to know what energy will cost 2 years from now let alone 23 years from now, but at todays prices the total cost for 23 years for the LED bulb is $49.68 vs our friend Lester at $141.9 for a net savings of $92 or a savings of $4.00 per year per bulb ( Philips must be counting on the price of power going up in their calculations). (1) The CFL and LED technologies, while they will certainly use less energy, are much more complex and simple volume scaling will not take them to the cost of an incandescent bulb. (2) Are all the components on the PCBs really rated for 7.3 let alone 23 years use ? That’s longer than the ATandT telecom standards ! I am not convinced that anyone has determined whether all the passive components currently used on these devices will last that long and if they don’t, it will not matter if the bulb was outputting 800 lumens at the time that the bulb failed. As we all know, a device is only as good as its weakest component. (3) Savings are tied to two main variables: (a) cost of power and (b) lifetime of weakest component. Increased price of energy makes them look better and failure of any of the components in the bulb will make their relative price increase significantly. For instance if a capacitor fails on the LED bulb after 4 years the new cost would be $12.80 / yr or double the cost of an incandescent. In fact the LED bulb needs to last 9 years to be equal to the cost of the incandescent. (4) Since the CFLs will cost more than 7X less than the LEDs most families, when faced with changing > 20 bulbs per household in the period of a year, will move to CFLs. Changing 4B bulbs to CFLs in a year will increase the mercury released to the environment by ~ 20,000 Kg with much of this concentrated in the urban areas where our population is concentrated. (5) IFTLE predicts that theft of light bulbs from public places will increase significantly in the future ! IFTLE has purchased said CFL and LED bulbs and they became operational on 8/15/2011. I will report back to you periodically on our real life testing. The breakeven point will be 8/15/2020 â??¦â??¦.. anyone taking bets ?